This story is dedicated to Ethan, who turns 7 years old today. Happy birthday, sweet nephew! May you have many excellent safaris in your future. Bellies full and Table Mountain crossed off our to-do list, we left Cape Town and flew 2½ hours east to begin the next phase of our vacation in South Africa: an actual, honest-to-goodness, wild animal safari in the bush. We were headed to Kruger National Park, or rather just outside it, where many people opt for a self-drive safari. 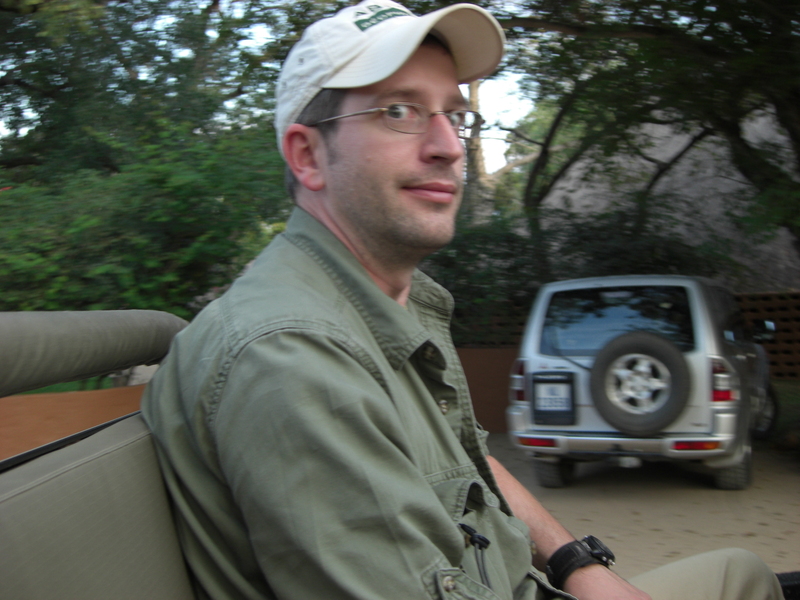 Us, on the other hand… we didn’t like the idea of wandering aimlessly around a savannah loaded with dangerous animals. We kind of wanted an expert to handle that. But first we had to get ourselves there. We picked up another rental car in Nelspruit and drove ourselves to the entrance of Sabi Sand Game Reserve/Kruger National Park, another 2½ hours. After entering the reserve through the park gates, we then had to drive ourselves a short distance further to reach our lodge… but this turned out to be an adventure all by itself. 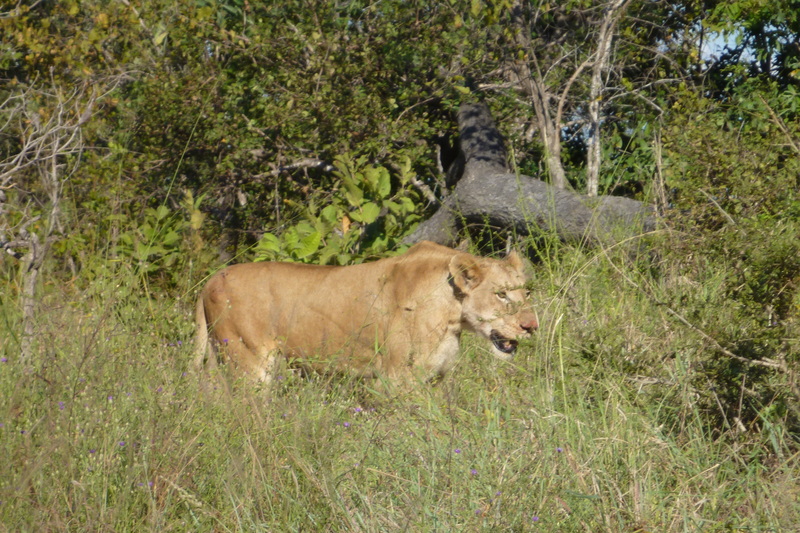 Barely a few minutes inside the park, we looked to our right and saw a lion in the bush very close to us. She’d just made a fresh kill, or was eating something bloody, anyway. We stopped and watched her, then realized we didn’t know what the heck we were doing. Should we be watching her like this? Are we too close? What does she think of us being here? We saw more movement in the grass and then realized there were at least three other lions there, all chowing down on something. They were the same color as the grass, and from the low vantage point of our tiny economy-size rental car, at the same level. 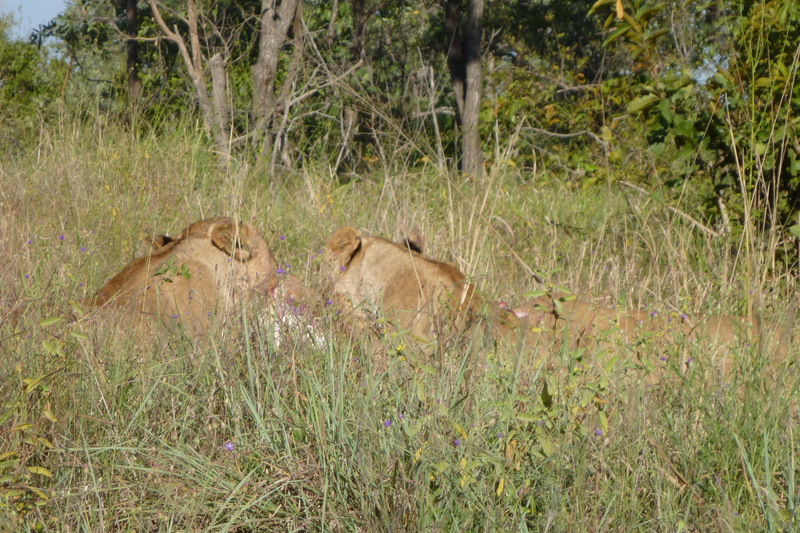 Difficult to spot, these lions! And so nonchalant, commonplace, as if they were squirrels or something. What if we’d had a flat tire and stepped outside without seeing them first? What if we DO have a flat tire during this drive… what are we supposed to do? We left the lions after a bit of nervous laughter, grateful for four good tires, then pressed on. 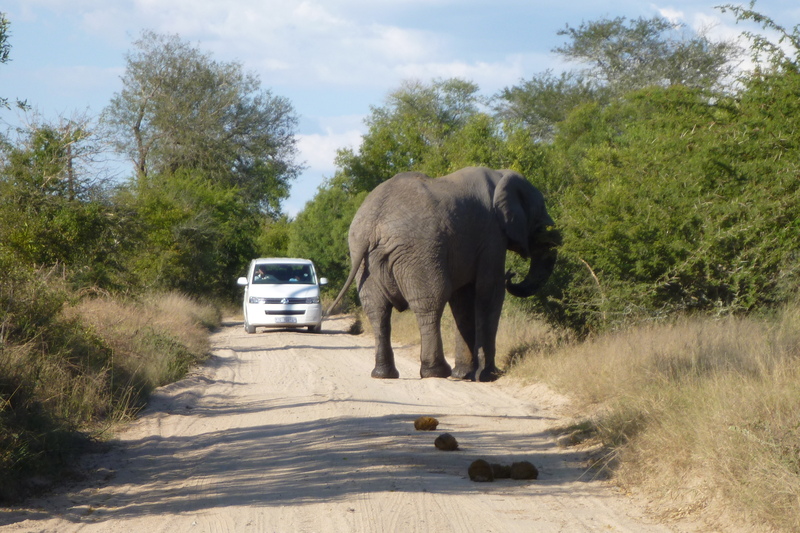 About ten minutes later we realize we’re about to start sharing the road with a large elephant. This makes us instantly regret having rented the super-economy size car. We must look like an ant to this elephant… a pesky, annoying, noisy little ant. We’d heard stories about elephants flipping cars with a flick of their trunk if they get annoyed. (Like this one.) What’s the protocol here, how is it supposed to go when tiny rental car meets mammoth? We have no information, no pamphlet, no road signs. The friendly agents at the gate who took our money for the entrance fee and made us sign an indemnity waiver didn’t tell us anything about the rules of the road. Guess we’re just supposed to try our luck in here? As the elephant moves, we slowly follow, keeping our distance. Luckily, another vehicle approaches from the other direction. A large minivan—obviously they had a better rental car company than us. They slow down but not completely, gently urging the elephant off the road. She obliges. Relieved, we press on. An hour later we have no idea if we’re on the right track. We’re driving on an unmarked narrow dirt road, clearly meant for vehicles bigger than ours, dodging kudu and impala and more elephants from time to time. Eventually we find a road sign pointing to all the various lodges but it does nothing to improve our sense of direction. A vehicle displaying a lodge name approaches, we flag them down and ask for ours. The driver looks at us curiously (perhaps it was the fear written all over our faces, or maybe the too-small car) and tells us to keep going. We pull into the lodge around 4:30. Our safari guide and two other guests had been waiting for us, hoping we’d make it in time to join them for the night safari, but just about ready to give up. There’s no time to unload the bags; we simply jump in the Land Rover with them and head out into the bush. Surreal. We’re in an open-top vehicle, bounding into the bush as the sun is going down to face head-on the animals we had been petrified of just a few moments before. We’re staying at MalaMala, a private lodge in the Sabi Sands Private Game Reserve, adjacent to Kruger National Park. 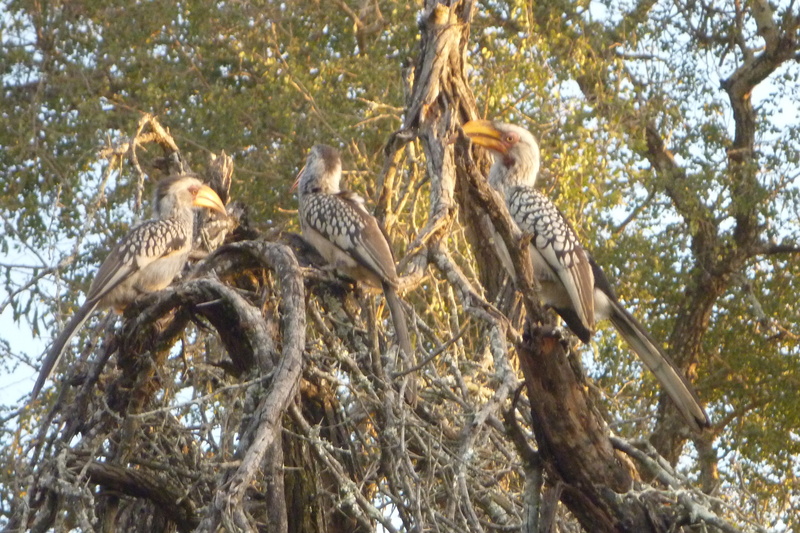 Kruger is famous in its own right; it’s South Africa’s first and one of the world’s largest national parks (at nearly 20,000 square kilometers/8000 square miles). It has more species of large mammals than any other African game reserve. But the private reserves are better, and here’s why. 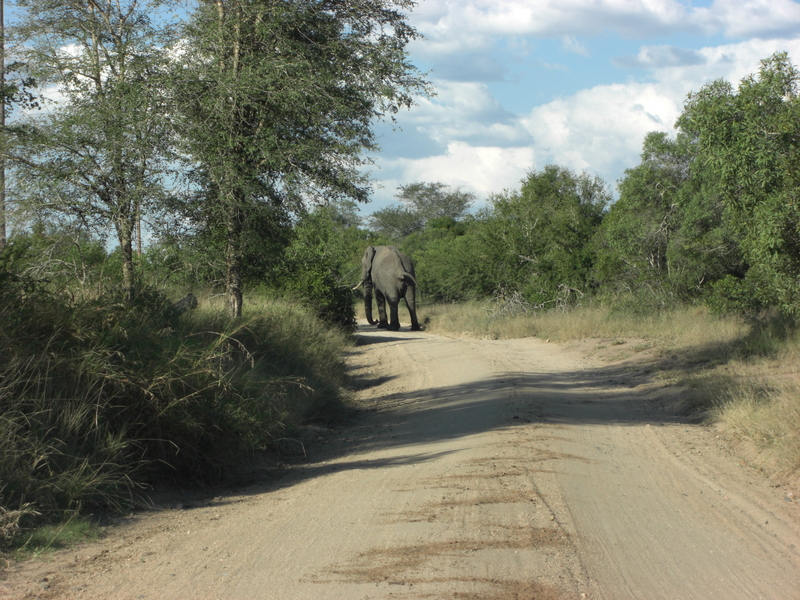 Kruger is popular with self-drivers, so it can get crowded and make it hard to move around. If there’s something interesting to see, chances are other vehicles will be there already, and if you’re stuck in the back you won’t be able to see much. At Kruger, vehicles must stay on the paved roads or 4×4 trails. Open-top vehicles are not allowed, and neither are night drives, unless you pay for a guided tour. Sabi Sands shares a very long fenceless border with Kruger, so the same animals are present. And a large river runs through it, attracting loads of them. 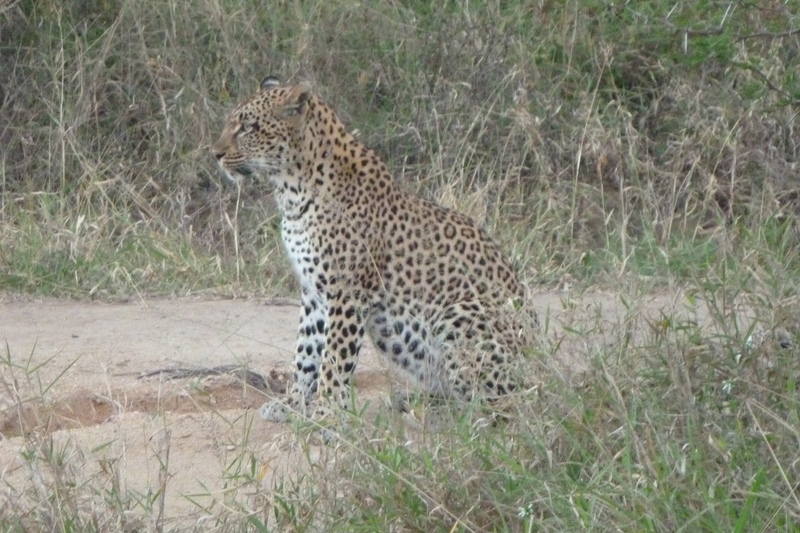 MalaMala is the largest private reserve in Sabi Sands, and one of the oldest. Thus it enjoys the best location, claiming most of that fenceless border with Kruger. The lodges are nestled around the Sand River, with game viewing possible from the pool, the lounge, or even your room. 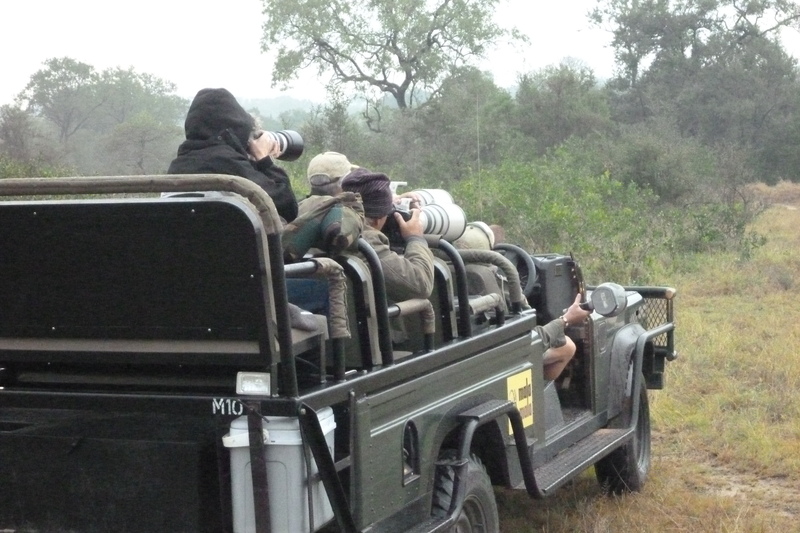 At MalaMala, all drives are led by professional and armed rangers (and very informative, helpful ones, it soon became evident to us), in stadium-seating open-top Land Rovers for the best viewing possible. Off-road driving, strictly prohibited at Kruger, is standard here. The rangers are constantly in contact with each other over discreet headsets, helping each other navigate to the exciting stuff. Because it’s private and no casual day visitors are allowed, there are far fewer people, and most importantly far fewer vehicles. Ok, enough with the marketing for MalaMala. They didn’t pay me to write any of that. But honestly, it’s a pretty special place. 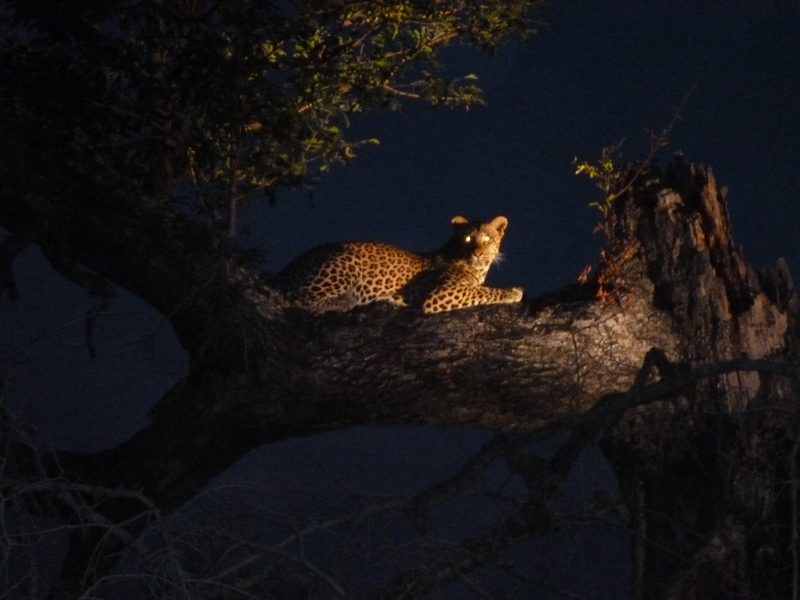 Within 20 minutes, Gary, our safari guide, spots a leopard. 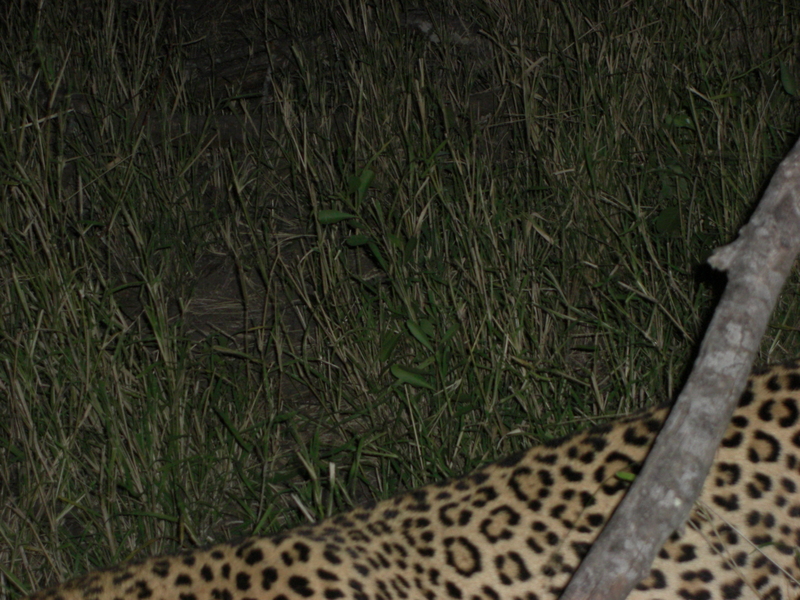 He maneuvers the Land Rover across ditches, over small trees, whatever it takes to get up close to this beautiful cat. I can’t believe my eyes. After a lifetime of seeing animals in zoos, it feels so strange to be with them in their natural habitat, so close to them. I feel like an intruder. When the leopard looks our way, I swear she stares directly in our eyes, reading our thoughts, smelling us, contemplating our flavor. I hold my breath. As a cat lover, I had imagined that I would find it hard to contain the urge to jump out and go cuddle or pet them. Now, the reality is that I’m scared silly. 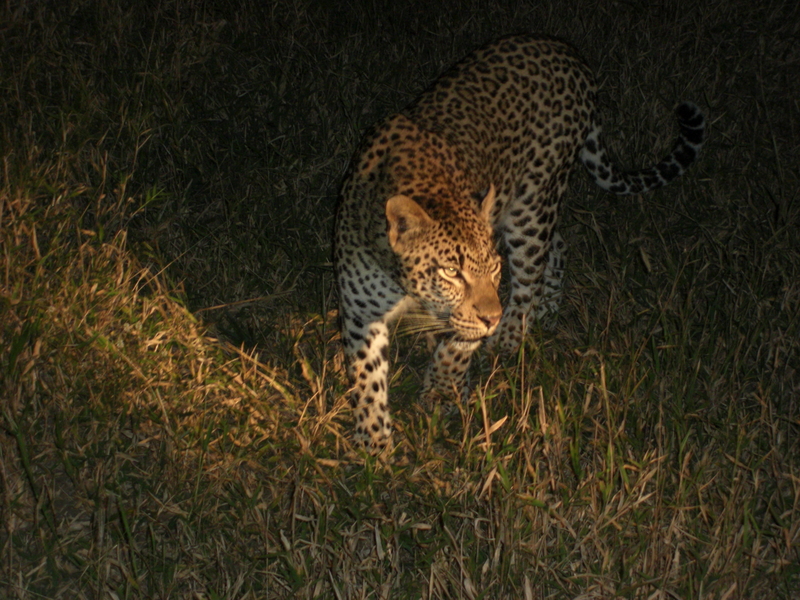 About an hour later at a second leopard sighting in the dark, Gary shines a very bright spotlight on the cat. He assures us this does not annoy her at all, though you’d never guess by the look on her face. 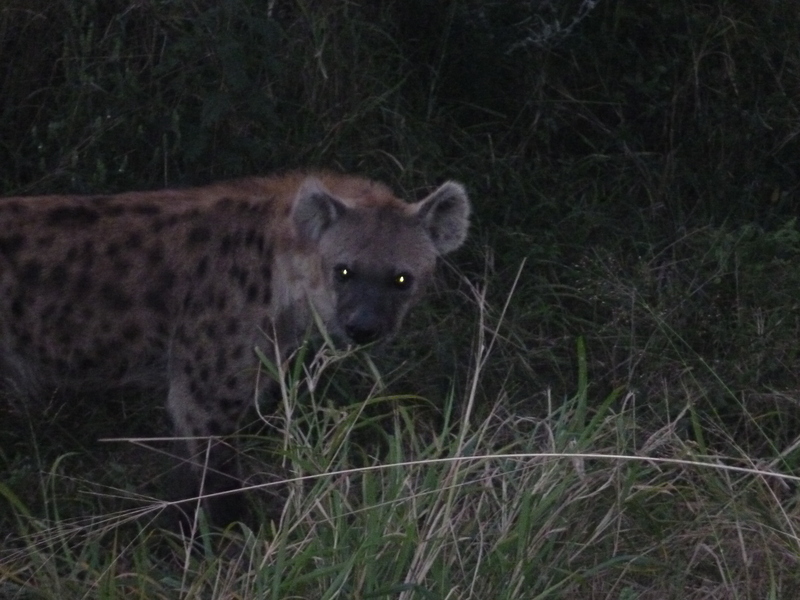 does a spotlight in the bush mean something tasty is behind it? Suddenly she changes direction and comes directly toward me, staring me down as if I were the one under the spotlight. I realize how easily she could leap into the Land Rover with us, surely landing on my face. At the last second she turns and walks alongside the vehicle. I could have literally reached out and touched her. Even though there’s a thick piece of metal between her and my legs, I can’t help but scoot away from her, teeth chattering, leaning into Seb on the other side of me, saying “oh my god” over and over. Halfheartedly I took this photo, just to prove how close she was. In fact, this is me leaning away from the beast. The door of the Land Rover (and my leg) is right on the other side of this branch. 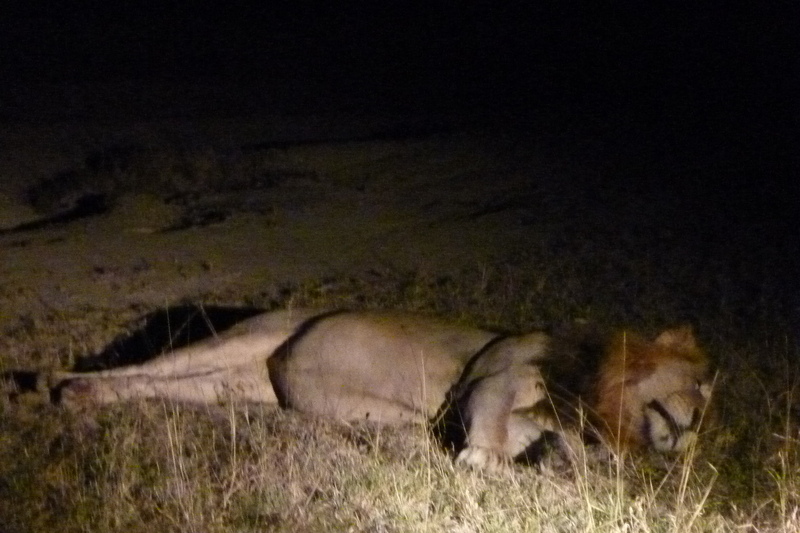 Then, as if all this wasn’t exciting enough for one night, suddenly we come across a lion, a huge solitary male. He stretches and lounges around under our spotlight as we get in close for pictures from all angles. We can’t believe our luck. Our Rover-mates remark that it’s like this every time they take a drive with Gary. We joke that we could have booked just one night here—our first time out and we see the Big 5 in a few hours? Done! 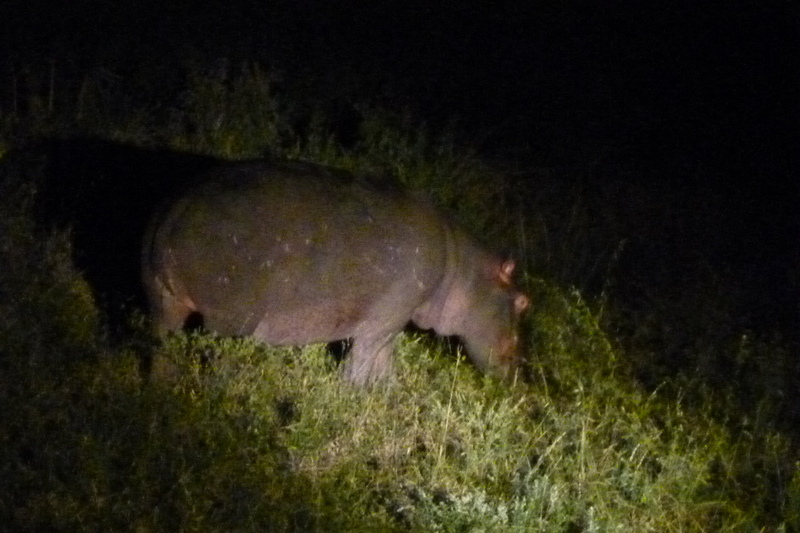 Technically, we’d seen 4 out of the Big 5 so far; we hadn’t yet seen any buffalo. The Big 5 is an old hunting mnemonic that refers to lion, leopard, elephant, rhino, and buffalo. These are the animals most wanted—and most dangerous—to bag on a hunt. The only bummer? Our cameras weren’t up to task. Especially for night photos. 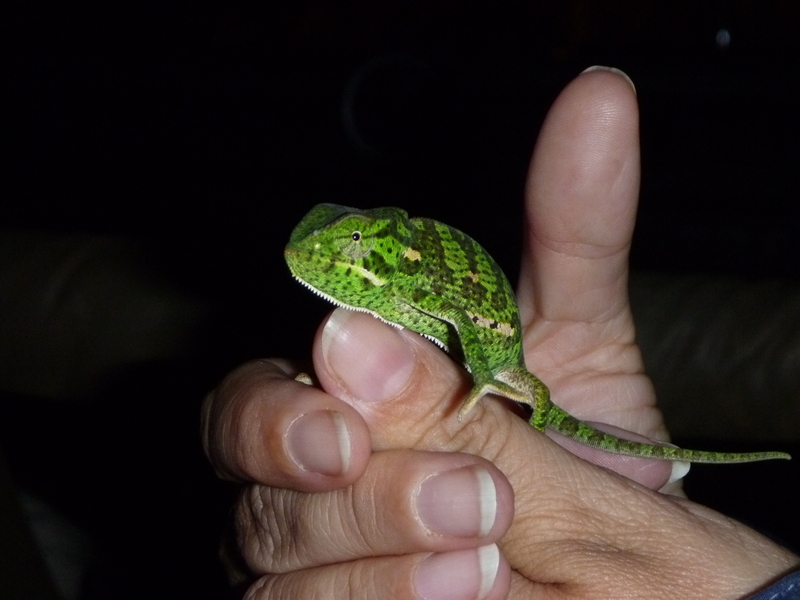 We both had crappy little point and shoot cameras; totally not safari-worthy. 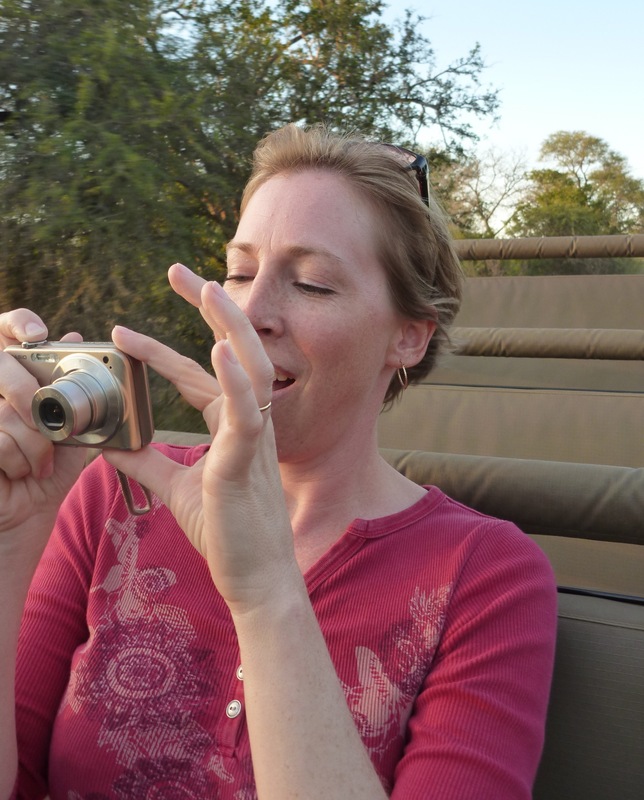 Within the first hour of our safari we saw another MalaMala Land Rover with four occupants, each holding huge cameras on tripods with 5-foot long lenses. We looked at them, then at each other, then at our own cheap little cameras and simultaneously said—Whoa. We’re a bit out of our league here. Gary told us National Geographic photographers and other professionals make a regular appearance here at MalaMala, but often the big cameras belong to amateur enthusiasts. We snuck this shot of some of these photographers a few days later… the folks on day 1 had even bigger equipment. We became a little shy using our own cameras in their presence. 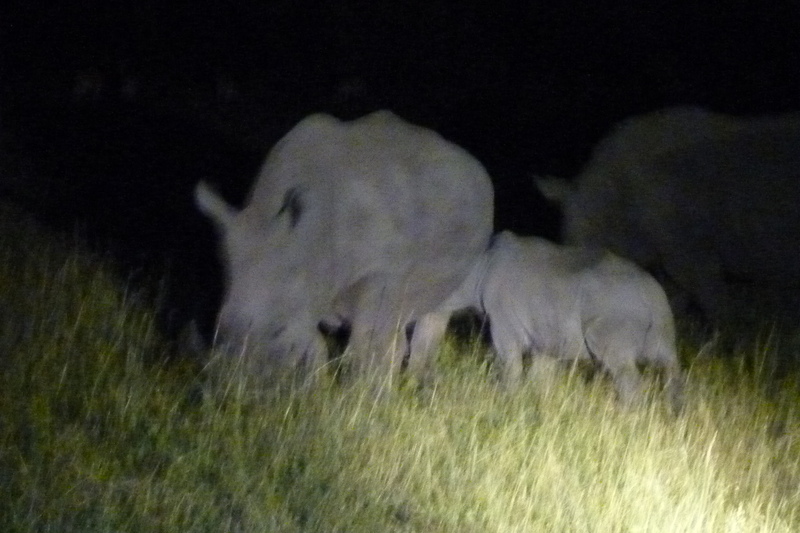 After our intense safari drive that night, we returned to the lodge for dinner, almost as exotic as the drive itself. It was in an open-air, reed-enclosed, circular “boma” complete with bonfire, jackalberry trees, a song and dance from the cooks to say thank you and good night. Afterwards, Gary escorted us to our room, a simple thatch-roofed affair but with ample space, including separate his and hers bathrooms. Dinner had barely finished at 10pm and we had a 5am wake-up call for the next morning’s drive. After such an intense day, we fell asleep quickly, but not before whispering to each other that we could hear lions roaring in the not-so-far distance. Enjoyed this story immensely! And Happy Birthday to our favorite grandson Ethan! Thanks Mom, I figured you would! This was pretty cool, Jen. I think you weren’t the only one relieved when that car came in the opposite direction. It looked like the elephant pooped on its arrival. Seb on safari without his Nikon? Totally awesome Jen! Wow. You are such a great writer! Thank you for sharing! Thank you Nicky, it’s so great to hear from you!! Please say hi to Andy and the girls for me. Loved the story and pics … thanks for sharing Jen …glad you and Seb–and your tour guide–are safe! Thanks Rick, that’s what I’m going for, glad to hear it’s coming across! Thank you Uncle John, I love how we’re able to keep in touch here plus Facebook, yay technology! Wow, thanks for the great story….enjoyed the pictures from my nice warm home with a little kitty looking at the big kitties on the screen! Thank you Heather for joining me here! Wait till your kitties see the photos coming in the next story…! What a great adventure! Ethan is going to love this story. He loves to bring his African souvenirs to school when he is the “class reporter”. I’m sure this story will be impressing the first graders next Friday! So glad to hear it Michelle! I would love to be a fly on the wall in Ethan’s class when he talks about it. He’s an honorary African by now. So cute! Thank you so much for your writing skills again and bringing your excursion home to all of us. It reminds us of our experience in Africa with the animals so close to our Land Rover. Yes! Such a bizarre feeling, isn’t it? On the one hand, you feel like you shouldn’t be there, so close and all, interrupting their lives… but on the other hand, they really don’t seem to care! It’s hard to explain. I’m so glad you & Carolyn, Redj & Edith got to experience it with us!